7.13.1 The freight movement through the city particularly on some of the arterials is already restricted in CBD area. Many orbital corridors cannot be easily restrained till such time the wholesale activities are concentrated in the CBD. The strategy already followed is to decongest the CBD by shifting the wholesale market to outer areas or proposed IFCs along the PRR. In order to facilitate the shifting of the wholesale activity from the core areas, both harsh measures in terms of restriction on the activities at their present location and incentives for relocation in the new areas will have to be followed. The restrictions in the central areas could be in the form of banning the entry of HCVs completely and permitting only LCVs between 10 PM and 9 AM; treating these properties as engaged in misuse activities and charge a very hefty misuse charge on a daily basis and a substantial increase in the property tax. All private vehicles should be banned from entering these areas between 9 AM to 10PM. simultaneously well developed wholesale markets may be created along side the IFCs with modern transport, loading and unloading, parking and ancillary facilities. These sites can be allotted to the persons relocating their business on no profit no loss basis on priority. The provision of PRR is itself going to help diversion of through freight traffic. 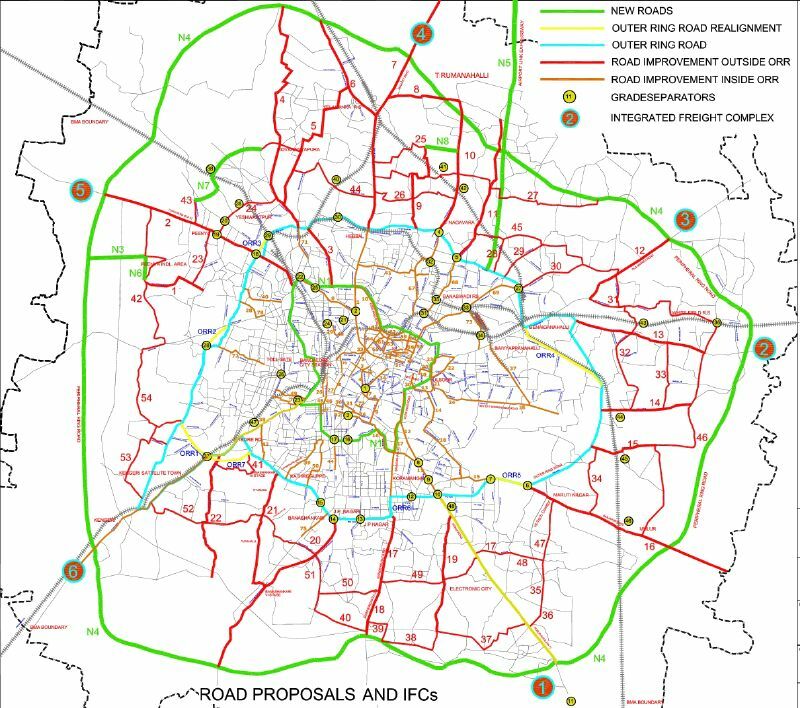 Nearly 80% of the ORR has lost the sole identity of ring road, the PRR being thought of in this connection will be a boon to the city. 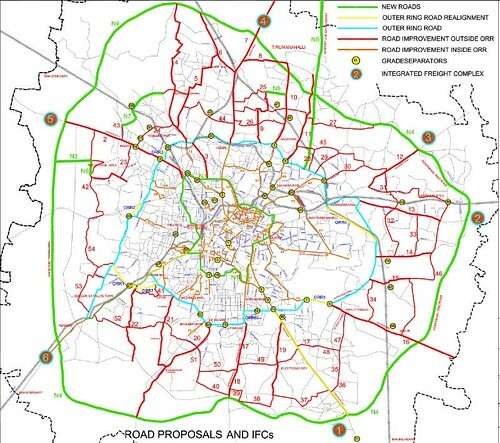 Development of another orbital ring road as proposed by BMRDA would also help in diversion of the freight traffic. So far there is no though regarding the shifting of the goods shed. If a ring railway is formed over the outer ring road, shifting of the goods shed to the periphery of the city can also be thought of. But this will take longer time. However, future planning of the rail facilities in and around Bangalore will need to be kept this in mind. Such shifts will have some adverse effect i.e. HCV/LCV movement from the goods sheds on the periphery and any wholesale complexes, into the city will develop. By suitable management measures like restricting these movements during particular timings of the day, problem can be suitably managed. In addition to acting as nodes for handling the HCVs traffic and diverting it on the PRR they will also act as center for wholesale trade. Quite a few wholesale markets to be shifted outside the central area can be located as part of the IFC for efficient handling for bulk goods.